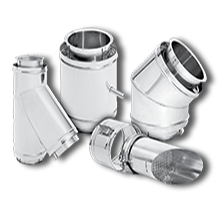 Single and Double-Wall Positive Pressure Special Gas Vent engineered for venting today’s high efficiency natural gas-burning or propane fired appliances, categories II, III and IV as defined by the Standard for Gas-Fired Central Furnaces, ANSI Z21.47 and NFPA 54. Corr/Guard® products are tested and listed to UL 1738 for positive pressure applications up to 15" w.g. Corr/Guard® features our exclusive Snap-Lock design in single wall and male to female slip connection in double wall, secured with self-tapping sheet metal screws. 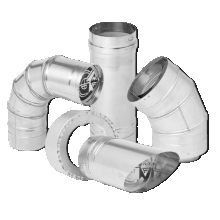 Manufactured from superferritic AL29-4C stainless steel flue for corrosion resistance and continuous laser welded seams create proper joint alignment increasing product reliability, and ease of installation in the field. For use with high efficiency category II, III and IV natural gas-burning or propane fired appliances such as gas boilers, furnaces, unit and radiant tube heaters, tankless water heaters, pool heaters and direct vent appliances. Corr/Guard® is tested and listed to UL 1738 for positive pressures up to 15" w.g., featuring a durable AL29-4C superferritic stainless steel flue designed for extreme resistance to chloride ion pitting, crevice corrosion, stress corrosion cracking and corrosion in moderately reducing environments. FCS Corr/Guard® incorporates an integral joint sleeve for easy joint alignment and aids to shingle condensate across the joint, preventing excessive joint corrosion and leakage. FCS products are manufactured with continuous laser welded seams and casings, improving durability, reliability and increasing efficiency. 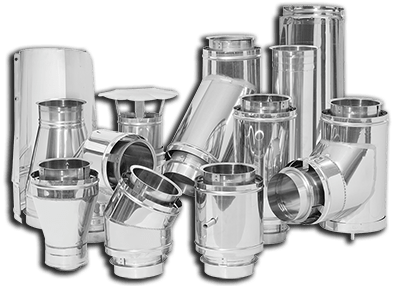 For use with high efficiency category II, III and IV natural gas-burning or propane fired appliances including gas boilers, furnaces, booster heaters, pool heaters, unit and radiant tube heaters and direct vent appliances.